Stan and I had met through a sign on the "partners wanted" board at the Boulder Mountaineer. I was relatively new to Boulder, and was looking for a person to climb with on a regular basis. Stan is a pleasant, soft spoken guy, and a good climbing partner. He could lead 5.9 or harder at the crags, and we spent a number of Saturdays cruising up moderates in Eldorado and Boulder Canyon. 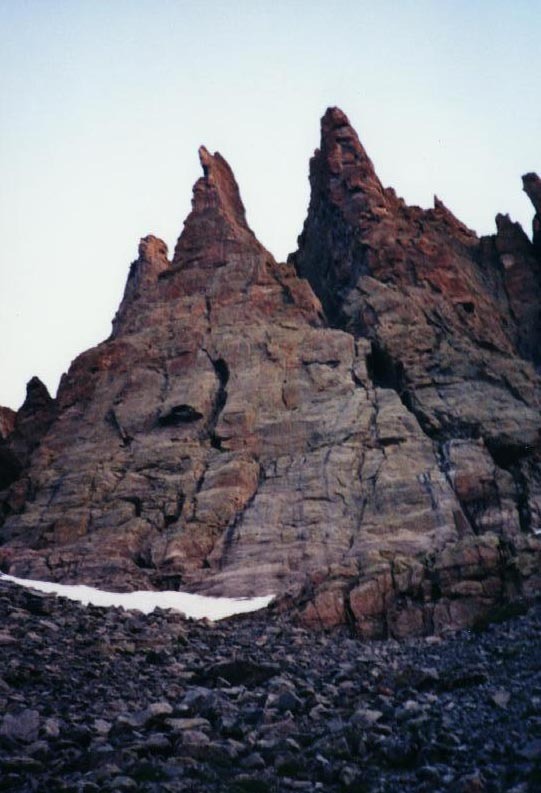 I can't remember when it was that we decided to climb the Petit Grepon, but it was only natural given our proximity to Rocky Mountain National Park. It was late August of 1995 when we finally got out and did it. We drove up to the Park on a Friday, got our bivi permit, parked at the glacier gorge trailhead, and headed up the trail to the Petit. We found a perfect bivi spot underneath a huge boulder, which formed a cave-like shelter. We spent a warm and pleasant night snug in our sleeping bags, protected from wind. We planned to get a super early start the next morning, but through some sort of technical difficulty, either our watch alarms didn't go off, or we weren't able to hear them through the layers of sleeping bag. As a result, it was already dawn when we awakened, and by the time we reached the base of the route, there was already a party ahead of us. By the time we began climbing, it was quite a bit later than we had hoped to start. We cruised up the first section, a relatively easy chimney, that led to a large ledge. The climbing from the first ledge was pretty straightforward until I led out of a narrowing chimney and had to traverse left across a face below a small bulge. The moves were extremely awkward, especially while wearing a pack, and my protection was not the greatest. I managed it without falling, and we soon found ourselves on the second ledge, a fine grassy place, inhabited by a very fat and very friendly marmot. 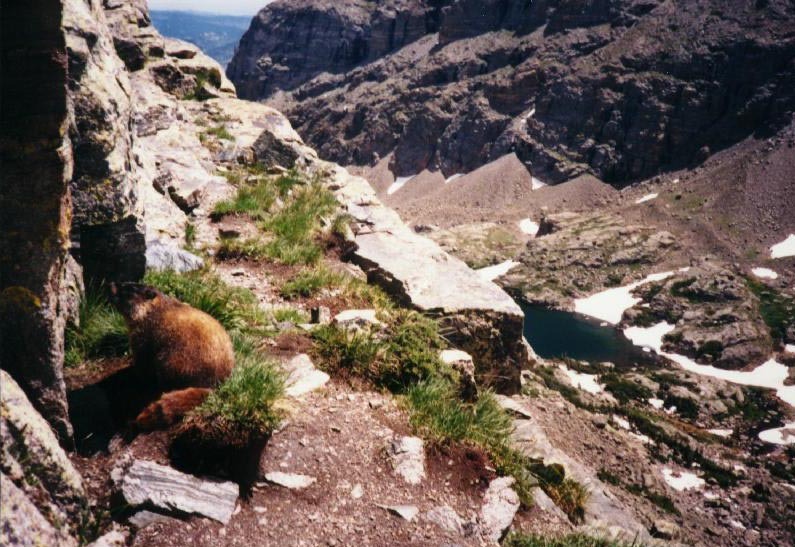 No doubt this marmot owes his well-fed state to Roper and Steck, who included the Petit Grepon in 50 Classic Climbs. There seemed to be little to sustain an animal of his size on such a bare, remote ledge other than the largesse of passing climbers. We tossed him a piece of an energy bar, which he gulped down with gusto. We admired the scenery, which was pretty amazing. After a short rest, we continued on up the face toward the top. The party above us had given up on the second ledge, and we now had the route to ourselves. The climbing was exhilarating and fun. Steep crack and face climbing on perfect rock. After two more pitches, however, the weather began to take a turn for the worse, and as I was leading up a crack, it began to rain. I finished the lead in the rain, and called for Stan to hang on and wait for the rain to subside. This was not just wishful thinking. The storms here were often of very short duration, and it was not at all unlikely that the current clouds would give way to blue skies again soon. We bundled on our rain gear and waited, but instead of lessening, the rain began to fall more heavily, and after about 20 minutes, it began to mix with sleet, as the temperature began to drop rapidly. As I watched the route begin to ice up, it became clear that we were not going to make it to the top of the Petit on this trip. I rigged up a rappel and slid down the rope to Stan. On our second rappel, disaster struck. The ropes got jammed in a crack when pulling them down. We pulled and pulled and tried twisting and flipping the rope back and forth and up and down, but to no avail. Only one end was down, while the other end dangled about 50 feet above our heads. We were afraid to simply climb up the rope, as we did not know how firmly it was stuck and did not want to risk having it come loose while we were climbing up it. By this time, the sleet was mixed with snow, the wind was blowing, and we were running out of good options. Finally, I climbed up as high as I could, we pulled down on the rope end as hard as we could, and I stretched up and cut the rope as high as I could reach. This left us with a 50 foot length of rope with which to continue our descent. Doubled up, this made for about 25 foot rappels, not nearly long enough to reach the regular rap stations. It took us a long time to get to the base of the climb, and we had to construct a number of anchors out of webbing and the occasional sacrificed piece of gear. It sleeted and snowed and rained on us the entire way down. By the time we reached the ground, it was dusk. We met a couple of climbers from Boulder who were there to climb the route the next day. They had watched our travails from the base, and offered to retrieve my ropes if they passed by them on their climb. I half-heartedly gave them my name and number, not expecting a total stranger to pass up the booty potential of two brand new 8mm ropes, even if one was 50 feet short. Stan and I gathered up our stuff from our bivi cave, and headed down the trail in the pouring rain. We headed for home, stopping at a Mexican restaurant on the way. We were tired, and hadn't made it to the summit, but we were happy nonetheless. The next Monday, I got a call from one of the climbers we had met at the base of the Petit. He had my ropes, which he gave me later that day. He wouldn't accept any sort of payment other than my thanks, even declining an offer that I buy him lunch. What a great guy. I felt good about getting my ropes back, but felt even better because of the nice thing this person had done for me. I hope it's true that what goes around, comes around, because he deserves some reward for the good deed he did. As for the Petit, I have some unfinished business on that climb. I'm looking forward to standing on the very top of that marvelous piece of rock.